Removing Indicator from Tap Handle to access screw underneath. Grub Screw: Other style taps have a grub screw directly underneath the handle: undo grub screw (be careful not to lose it) and pull off handle. Usually you pull directly out (don’t pull at an angle as you might damage the body or the handle. 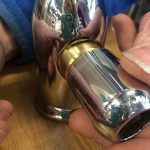 If handle is stiff, then please check out the Tips at the end of the Blog. 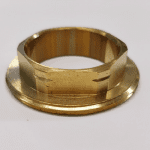 When these are removed you will be able to see a small brass screw in the centre of the handle. If your handle does not have any indices e.g. the H or C is just etched out on the handle, check underneath your handle as there should be a grub screw underneath. Twisting off Shroud covering the valve (or remove if there is a grub screw underneath that you will loosen with Allen Key). 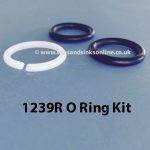 When you have removed the outer handle the inside shroud covering the valve can then be twisted off to uncover the top of your valve. Again sometimes there is a screw underneath this as well that has to be removed before this shroud can be removed. Below in the video is an example of removing a handle and valve hood where the handle is held in position with a grub screw and the hood covering the valve is also held in position with a grub screw. 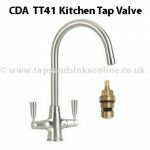 See our Blog 7 easy steps to change a kitchen valve. 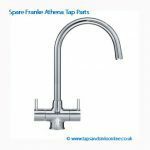 Tip 1:Perrin & Rowe recommend for their taps / Franke Triflow models: If you cannot remove the hood (shroud) that covers the valve due to build up of limescale – try soaking it for max 30 mins at a time in a solution of 50% lemon juice and 50% water. You can repeat this as often as required provided that in between you completely wash away the solution. Tip 2: Where Handle has Seized up i.e. Grub screw removed and handle still stuck : You could try Tip 1. 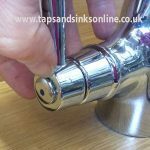 If this doesn’t work, you could try to a lubricant oil like TT Oil or WD40 etc around the joint of the handle (but be careful applying / do a test patch first on a part of your Tap that is not visible as you don’t want to damage the finish on your Tap). Then cover the handle in a cloth. Then turn the handle to “on” and apply reasonable force to pull it off. A small trickle of water might come out but that is all as you should have already turned OFF your water as advised at the start of this. If it still won’t move tap it with the likes of a mallet or back of a nail punch etc. This should remove it. If in doubt, we always recommend consulting a plumber to ensure that you do not damage your Tap. if you want to email us a picture of where exactly your valve is stuck i.e. what step in the process of removing it, we will look at. Just email it to sales@tapsandsinksonline.co.uk and mark if FAO Alice. My handles are stuck to the Valve. Would you know how to loosen it? The small screw was removed long ago, and the handle would not come off. Hi Adela, You have the Ascona Tap. If you have removed the grub screw that means that your handle is literally stuck to the valve. We suspect that the handle has simply just seized up as it has never had to be removed before. You need to turn off her water, apply a lubricant oil or WD40 etc around the joint of the handle, then cover the handle in a cloth. From there you need to turn the handle to “on” and apply reasonable force to pull it off. You could tap it with the likes of a mallet or back of a nail punch etc. This should remove it. We always advise: if in doubt please contact a plumber. I have a San Marco blade tap and have ordered a new valve from you but I am struggling to remove the lever. It is hard to even see if the grub screw is in due to the position of the tap. Can you tell me it is is an allen key fitting and what size it would be? Thank you for your query. To remove the handle you need a small Allen key as the grub screw is on the underside of the Tap handle. I’ve got a leaky Franke Olympus tap (leak is at the lever). Accessing the grub screw is fiddly but I can’t seem to identify the correct size of allen key. Is there a standard for this make? Different versions of the Olympus took different grub screws. You could try a 2mm Allen Key. I have a 2 yr old Cooke & Lewis Zale monobloc 2 lever tap which leaks frequently on the warm tap side. How do I fix this? Hi Alice, I’ve had the same problem with my taps…taken the grub screw out,can’t get the handle off. Can you help please ? what tap do you have ? Like the response to the other gentleman just now, we are taking a look here to see if we can help in anyway. 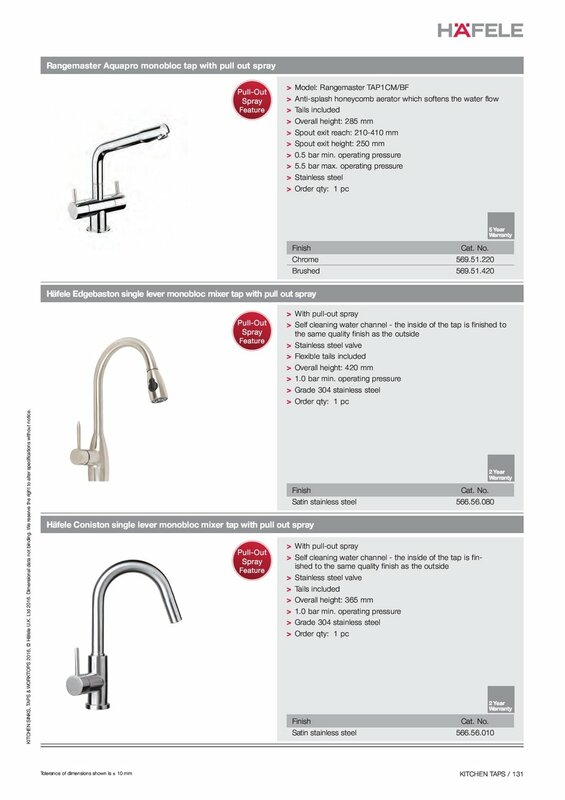 I have a hafelle kitchen tap with a single side-mounted lever (the handle’s very similar to the bottom taphere http://hafele.com/gb/en/external/blaetterkataloge/Sinks-Taps-Worktops-Directory-2016/blaetterkatalog/large/bk_133.jpg ). There’s no grub screw to remove the handle. The handle lever (the long thin cylinder) looks as if it’s screwed in but I can’t seem to unscrew it. Any ideas? They are the only two options i.e grub screw or handle screwing out so if you have no grub screw, then your handle must screw out. You could try WD40 or some kind of releasing agent but be careful of the tap finish. It could take the chrome off your tap. Thanks. Already used a bit of WD40, so it looks like I just need to get a better grip and apply some extra elbow-grease then. I’ll give it a couple of goes over the next few days . We would recommend a plumber at this stage in case you damage your tap. Hi Alice thank you for the e-mail. unfortunately I am still unsure whether we are supposed to use an allen key on the underside of our tap handles to remove them. We have tried but cannot remove the grub screw (if there is one)? Our tap looks SIMILAR to a Lamona Victorian Regino Elbe Twin lever tap. But we don’t which model for sure. HI Charles, without knowing the brand of your tap I cant give you specific guidance BUT if there is no grub screw (and a mirror will tell you if there is one there or not, or feel with your hand) then usually that means that you need to remove the indicator to get at the screw that is concealed by the indicator. 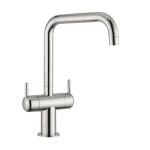 I found the general instructions excellent (and Alice’s replies) but cannot for the life of me find any way to remove the chrome shroud with rod/lever to operate “on” or “off” on my Franke Zurich chrome kitchen sink taps, where the cold one has started to drip. Managed easily to prise off the cap that hides the screw and to remove it, but no grub screw sockets either on the shroud or elsewhere. Might it be that the “on/off” rods that connect to the tap shroud unscrew? They certainly don’t feel like I could pull them off and could send a jpg shot to illustrate the problem, if needed… Grateful for your reply, though not an emergency ! Thank you. 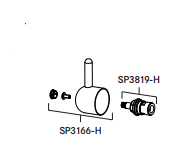 if you look at the diagram that i showed you , the entire SP3166 should come off.